43 Lukie Points will be rewarded to you when you buy this. From the United States, Canada and Japan they came. The world's premier designers and their finest robotic warriors traveled to do battle in the First Annual Robot Tournament. While they thought they were just competing for fun, they get some horrible news on the eve of the Grand Championship. The sponsor of the Tournament used it to gather the world's most powerful robots in one place. 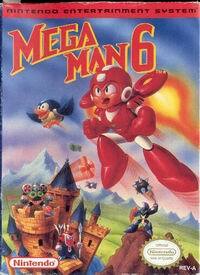 Now faced with an army of metallic mercenaries, Mega Man must fight a ferocious new foe - The Mysterious Mr. X! THIS VIDEOGAME IS VERY NICE, I RECIEVED THE VIDEOGAME IN PERFECT CONDITION LIKE NEW, THANKS LUKIE GAMES!! My favorite in the series!! The first mega man 1-6 classics! MM6 is the worst game in the series. 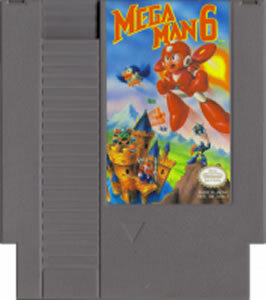 It just seems like maybe capcom was just lazy and threw out a new mega man to make a quick buck from its name. I think this is a fantastic end to the nes Megaman series, MM 6 has amazing graffics soundtrack and story line like they always do. 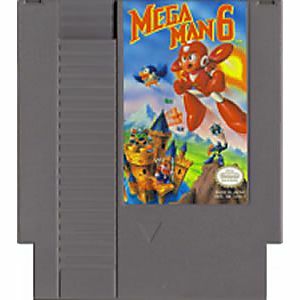 Megaman is one of my favorite series on the nes and I enjoy playing MM 6, I don't think I can say anything bad about this game. It is rock solid, but I found meganman to move slowler in this game like when you do the slide. "might be just me"I don't know. It's a great game everyone can get into and enjoy!